For the third consecutive month, Russia has seen an increase in industrial activity. According to analysts, this growth is mostly associated with a slight devaluation in the ruble this year and government support for the manufacturing sector as part of the import substitution program, as well as a reaction to EU and U.S. sanctions. In spite of a stagnation in GDP, Russia has seen an unusual increase in industrial activity. According to research conducted by HSBC Bank and the Gaidar Institute for Economic Policy, Russia has posted an increase in industrial production for the third month in a row. "The manufacturing sector is quite effective in meeting demand and, in spite of the overall economic situation and expert forecasts, it has maintained positive growth,” the Gaidar Institute study reads. According to the authors of the study, engineering and metallurgical companies, which secured an additional share of the domestic market as a result of the ban on supplies from Ukraine, have posted better results. They were joined in August 2014 by sectors focusing on domestic consumption, including the food industry, which is also counting on replacing some imported food products. However, according to analysts, import substitution could not have started in June 2014, and the industrial growth is in fact a consequence of the events of February-March 2014, when the ruble underwent a slight devaluation. 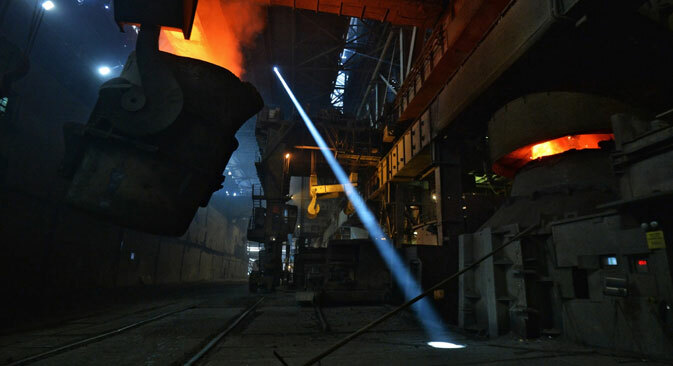 According to UFS IC senior analyst Alexei Kozlov, Russian industrial production rose in August for several reasons, the first of which is “the increase in demand for products from the metallurgical sector, as a result of the need to replace the supply of products from Ukraine,” he said. In addition, Kozlov attributed the demand for steel and other metallurgical products to the implementation of pipeline construction projects, in particular the South Stream pipeline to Europe and the Power of Siberia pipeline to China. "The second reason is an increase in state orders in the military-industrial complex," Kozlov noted. The third reason is growth in food production and the agricultural sector as a result of the need for import substitutes, he said. As the head of Russ-Invest’s analytical department Dmitry Bedenkov pointed out, the recent growth in production has been driven by the manufacturing sector. "Over the past seven months, growth in these sectors amounted to 2.6 percent, compared to 0.8 percent in the mining sector," the expert said. According to Anton Soroko, an analyst at investment holding company Finam, ruble devaluation was the main reason for growth in the manufacturing sector, along with growing demand from China. "Food producers are going to receive excess profits due to decreases in imported products, which could previously out-compete domestic food products," Soroko added. Olga Izryadnova, head researcher at the Center for Macroeconomic Research at the Russian Academy of the National Economy and Public Administration, said that the industrial production index was 101.5 percent year-on-year in January-July 2014, with the manufacturing sector experiencing the highest increases in production. According to her, consumer goods production over the same period increased by 3.3 percent, passenger car output by 5.7 percent, and truck production by 12.7 percent. Textile and clothing production increased by 6 percent, while the production of electronic components for communications was up by 17.6 percent. However, not all sectors of the Russian economy demonstrated growth. Alexei Kozlov pointed out that the service sector and the financial sector were both among the lagging parts of the economy that dragged down GDP growth in the second quarter of 2014. “Mass revocation of licenses from banks, ruble instability, and rising geopolitical risks all had a negative impact on the activities of financial institutions," he said. According to Izryadnova, reductions in the consumption of hydrocarbons from Russia also had a negative impact on Russian economic growth. "Decreased exports of commodities and products made from these commodities, as well as reduced construction and property investment, had a negative influence on overall economic indicators,” Izryadnova said. Moreover, car production in January-July 2014 fell by 0.7 percent, and truck production dropped by 21.1 percent. Experts note that if industrial production continues to grow, it is likely to exceed even the forecasts made by the Ministry of Economic Development - 1.7 percent for the year. According to a study conducted by the Gaidar Institute, in the best-case scenario, Russian production can keep growing until the first or second quarter of 2015, when the industrial sector will feel the effects of import substitution associated with the ban on food imports from the EU and the U.S. This may bring the Russian economy out of stagnation. However, according to Soroko, tensions with the West will have negative effects on the Russian economy in the short term.